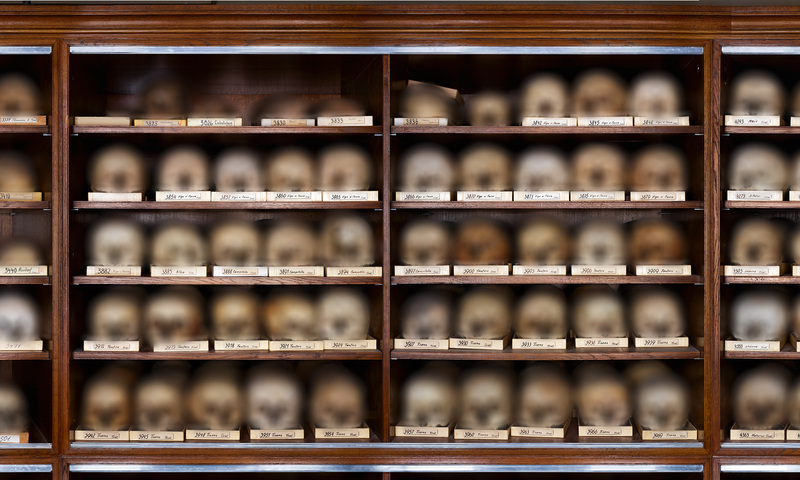 Part of the TRACES project, Dead Images is an artistic exploration of the complex and contentious legacy of collections of human skulls that held by public institutions in Europe. These assemblages of the remains of the dead were created during the 19th and early 20th centuries, when scientists sought to elaborate ideas of human difference through the comparative study of crania. Some skulls were taken close to home, others were looted from battlefield sites or the graves of indigenous peoples, taken without consent and in violation of local beliefs concerning the sanctity of the dead and the reverence for ancestors. We live with this legacy. It resides in our cities. Often it is hidden but it is still with us. The Dead Images exhibition, created by Tal Adler in collaboration with a team of fellow artists, historians, bioarchaeologists and anthropologists, brings this legacy to light by exhibiting a life-sized 30 meter photograph of part of one such collection, a gathering of more than 8,000 skulls which resides on shelves along a corridor in the Natural History Museum of Vienna. In exhibiting this photograph, this exhibition asks questions of ourselves, our ambivalent curiosity and our own desire to see that which is withheld. Who are we to show such a photograph and to gaze upon the bones of others as an artistic or scientific spectacle? We explore these questions through a series of filmed works, in which different people speak to this history, their own beliefs and feelings and whether or not we should display this photograph. The choice to see the photograph, finally, rests with the visitor and in making a choice visitors are asked to reflect upon this history, the work of bringing this history to light, the ethics and politics of making such a display visible and the role that descendants, curators, scientists, artists and the public may play in reimagining a place and purpose for these remains of once-living people. On the evening of June 28th, 2018, we invite you to join us for the opening of this exhibition and wine reception. This will be preceded by a conversation between the artist, Tal Adler, and Charlotte Roberts, professor of bioarchaeology at the University of Durham and hosted by Sam Alberti of National Museums Scotland. On the following day, Friday 29th of June, there is all-day conference in which the issues raised by this exhibition and the retention of collections of human remains will be discussed by an international gathering of artists, academics and activists.